Root canal therapy is the process of removing infected, injured or dead pulp from your tooth. 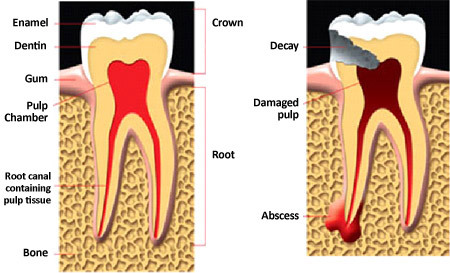 The space inside the hard layers of each tooth is called the root canal system. This system is filled with soft dental pulp made up of nerves and blood vessels that help your tooth grow and develop. Contrary to popular belief the treatment usually is a painless procedure. Thanks to modern technology, the process has shortened and is more efficient today making the procedure similar to a filling. Our teeth are meant to last a life time, however; sometimes damage occurs to the tooth (often caused from a deep cavity or an injury that causes a tooth to crack) and inside the tooth becomes infected. This infection damages the pulp of the tooth – the network of blood vessels and nerves inside. Left untreated, the damaged pulp can cause infection that will damage the bone around the tooth and cause swelling and pain. If the damaged tooth becomes infected, our specialized staff at Qualident-Dental can perform an endodontic treatment (often called a Root Canal) to save the tooth. Endodontic treatment involves opening the tooth, removing the damaged pulp, cleaning, shaping, filling and sealing the tooth. Depending upon how much infection there is in the injured tooth, we at Quali-Dent will evaluate whether you need to be put on medicine prior to starting the work.